The idea of food becoming extinct may at first seem strange but if a breed is allowed to die out, then along with them go the special qualities that make them unique and these qualities may never again be found. The meat from rare breed animals is renowned for its flavour and succulence. Pure breeds have unique eating qualities that remain constant. To help preserve these heritage breeds, they must regain the support of the buying public. At a trial conducted in the UK, the Large Black was judged the best of all the breeds for taste and eating quality. To enquire about Yarra Valley Free Range Pork or to order any of our smallgoods please e-mail us. By doing so, you will be supporting biodiversity and helping to ensure a viable future for these endangered breeds. Why buy pork from Heritage pigs with a pedigree? Pedigreed pork is a real alternative to the product you find on supermarket shelves that comes from commercial hybrid pigs. Heritage pigs are bred to produce pork with real old-fashioned flavour using their own natural* genetics that can be traced back for hundreds of years. As breeders of pedigreed pigs, we keep small numbers and, for your peace of mind and to guarantee traceability, welcome visitors. This way you can see for yourself how the pigs are raised. The biodiversity that pedigreed pigs hold within their genes is vital for the future. Who knows what as yet, undiscovered traits exist that are exclusive to this heritage breed? * No genetic engineering here. 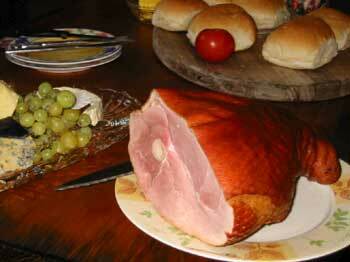 One of our delicious hams. Where can I try Yarra Valley Free Range Pork? We attend regular farmers markets, click here for more information. We can deliver to most areas in and around Melbourne. Click here to find out how to order a Pig In A Box. You may pick up your order from the farm gate in Macclesfield. If you choose this option please order two weeks in advance. How are the pigs transported to the abattoir? Christine loads, transports and unloads every pig herself. No transport companies or contractors are ever used. Her pigs are accustomed to handling and being moved around the farm and happily walk into a specially made pig float for the journey. They have straw for bedding in this float. Where are the pigs killed? Our pigs are killed at an abattoir in Laverton, Victoria. The people there know and understand our requirements for the humane handling of livestock and are respectful of our wishes. Before slaughter, our pigs are euthanised by the use of carbon dioxide. As the planet struggles to cope with Global warming, ask yourself what part you can play to assist. One way is to Buy local food. The embodied energy (food miles) in food that has travelled long distance to its point of sale is simply not sustainable. Doing our part, we believe in not only farming sustainably but selling sustainably also. We sell to local outlets, attend local farmers markets and sell in bulk giving people the chance to support a local farmer and reduce their impact on the earths dwindling resources. What Is The Term 'Bred Free Range'? 'Bred' Free Range is a relatively recent term coined by a few opportunists marketing their product as free-range and also, when butchers themselves label it as such in their shops. In reality it is only the mother that lives outside and, when her piglets are weaned (usually at three weeks of age! ), they are raised in enclosed shelters or sheds the majority of which contain straw over a cement floor. So, in reality, the pork products you may have bought in good faith were not free range. This label is causing a lot of confusion amongst consumers so don't be afraid to ask the retailer to tell the truth. Is it genuinely free-range? What is the name of the producer? Can you visit to check? Christine's pigs are fed a grain based homemade mix and allowed to graze on the lush pastures of the Yarra Valley. They are reared outside and are free from hormones, chemicals and antibiotics.